Tii's wire terminal connectivity solutions for broadband-enabled services and network management are designed for easy installation, minimum maintenance, and maximum protection. 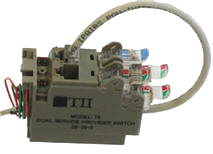 Our gel-sealed IDC terminations can reduce installation time and increase reliability, which means decreased costs and increased customer satisfaction. Our wire terminal line covers a broad range of 'service' and 'customer' connections. Tii offers a variety of accessories that enable universal compatibility with competitor's products. Tii-Porta Systems Connector Blocks protect personnel and valuable equipment from damaging electrical surges that may get onto incoming cable lines. Tii–Porta 88 Equipment Terminal Blocks are used to terminate the exchange equipment pairs on the horizontal side of a conventional main distribution frame (MDF), and provide the cross-connect field for jumpering to the Outside Plant (OSP) vertical side of the frame. Tii’s wire terminal connectivity solutions for broadband-enabled services and network management are designed for easy installation, minimum maintenance, and maximum protection. Our gel-sealed IDC terminations can reduce installation time and increase reliability, which means decreased costs and increased customer satisfaction. Our wire terminal line covers a broad range of ‘service’ and ‘customer’ connections. Tii produces a range of products that help cable companies deploy VoIP telephony swiftly, seamlessly, and efficiently. With Tii’s proprietary switching technology, the telco phone signals continue to pass through until the existing phone number has been ported over and the signal automatically switches to the cable phone service. This means cable companies can complete a Triple Play installation on the first truck roll.